I have been getting emails from readers asking about the wall colors in my home. It’s no secret. I use BEHR paints and I love it. In fact, I am in partnership with BEHR with my current house painting project. You see, I love BEHR so much that I contacted them to tell them how much I love their paints and asked if they would be interested in sponsoring my house project. And it worked. Let me tell you a little about me and paints. I am so non-commital when it comes to deciding on paint colors. It seems so permanent to me. And many of you say, “Don’t worry. If you don’t like it, just paint over it. It’s cheap.” To me, it’s not really that cheap. All the paint supplies and each gallon of paint is around $20-30 with rooms needing more than just one gallon. Not to mention the amount of time it takes to tape everything and paint. With two little children who likes to be involved, it’s quite an arduous task. 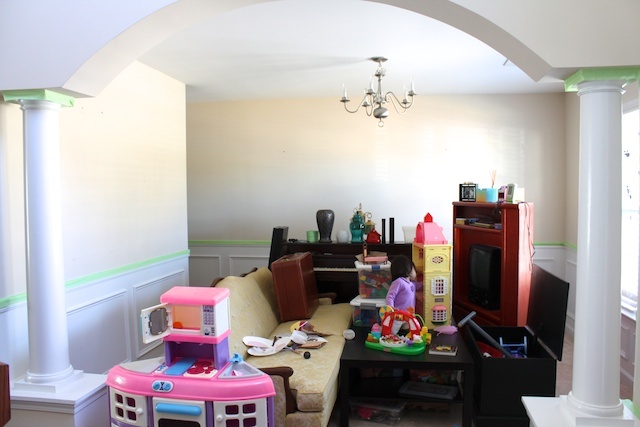 Needless to say, we only had three rooms painted in our house – living room, kitchen and our master bedroom. 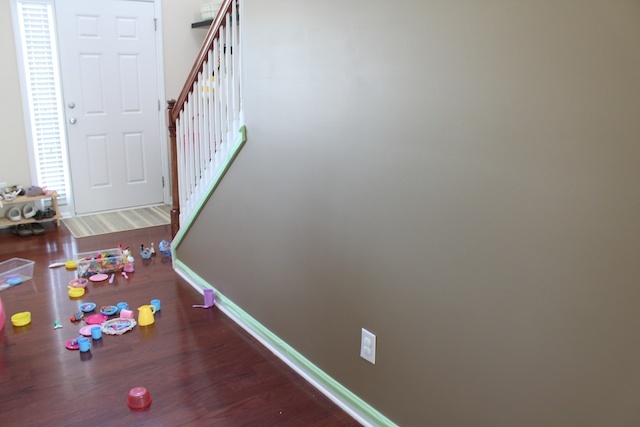 I used BEHR paints with those three rooms and was extremely happy with the quality of paint. But then a few months ago I decided I wanted to lighten our house. We don’t get a lot of direct sunlight inside the house. The previous colors were making the rooms darker and I want brightness in my life. 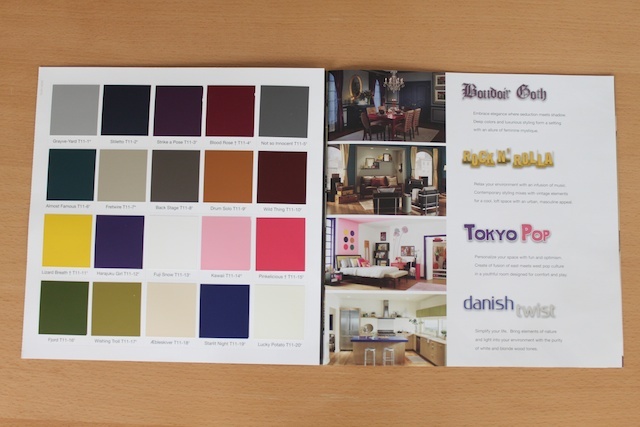 BEHR recently came out with their new Color Trends and I quickly selected some of those colors for our kitchen and the girls’ bedroom. 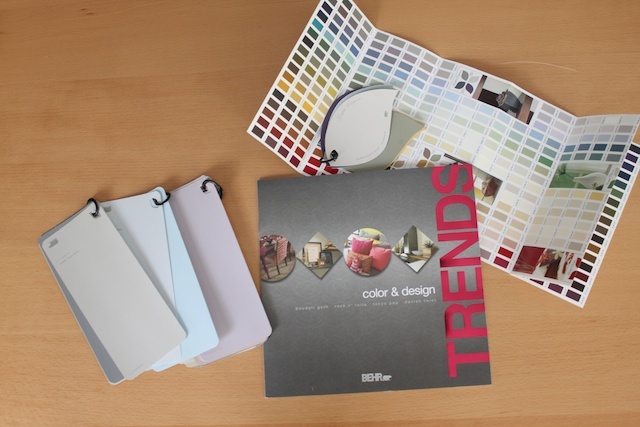 You can download the new Color Trend brochure here. I also checked out their Premium Plus Ultra paint colors. Their Premium Plus Ultra paints is my new favorite thing. Best paint on the planet. It’s primer and paint in one. 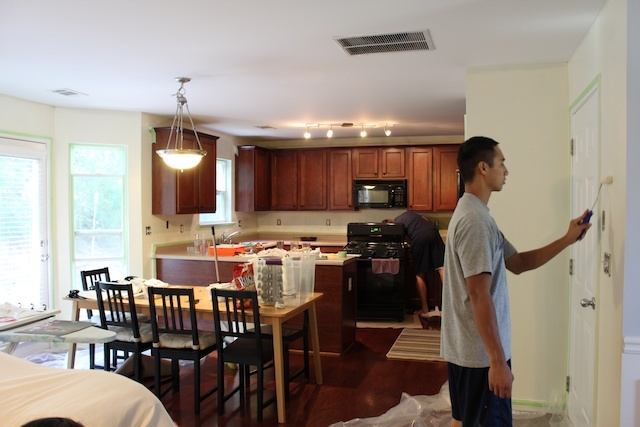 We used less paint and spent less time painting by using Premium Plus Ultra. Anyway, here are the new paint colors in five different rooms in our home from BEHR paints. I will go through all the before and after later room-by-room. It’s an on going process because I am also changing the decorations and furniture in some of these rooms. You know, you start one project and then it snowballs. These colors on your computer screen doesn’t do justice. I would recommend going to your local Home Depot store to pick up the actual color swatches to get a better feel for the actual colors. Lucky potato. Dining room and kitchen. Powdered blush. Kawaii. Pinkelicious. Fuji snow. English meadow. Girls’ room. » Tell me… What kind of paints do you like to use? And how do you go about choosing paint colors for your home? I typically use Benjamin Moore paint, but I know my mom has used BEHR in the past and been pleased with her choice. I choose colors based on the mood I want to create in the room. 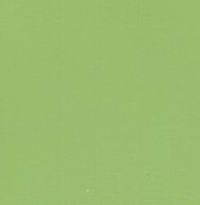 I want a warm, cozy kitchen, so deep red for me, a bright, motivating tv room, so avocado green. It’s a matter of personal preference, I guess! I love BEHR colors! We went super dramatic in our kitchen with Aging Barrel. I get the best compliments on it all the time. I think you also just found my playroom color with yours. 😛 I have been looking for a subtler blue color, but I haven’t pinpointed the color until you posted this. THANKS! I am so glad someone agrees with me that paint’s just not that cheap! Love the way the colors in your house go together. We’ve used Behr and Freshaire. Love the Behr colors and selection. I did not like the primer we used for our blue walls b/c it seriously smelled for over a year. We used Freshaire in our little girl’s nursery. It was a dream (odor wise) to use in the winter. We didn’t have to air out the entire house and it didn’t bother my hyper sensitive pregnant nose. However, there are limited color choices and the paint doesn’t seem to hold up to little markings as well as the Behr stuff. Can’t wait to see the rest of your house! I’ve learned my lesson when it comes to painting – sometimes trying to save money by getting the cheap stuff costs more in the long run (because it doesn’t cover well or hold up as long, so I always end up doing it again anyway). Picking colors is agonizing! I can never tell without putting a test swatch on the wall if it is the right color or not (luckily most places will mix small sample cans for cheap). I’m excited to see how your rooms turned out! i love color!! I usually use Sherwin Williams or Kwal Howell. but if i find a color i like… I know what you are saying about cost… hey, with 6 kids, i understand that $30 bucks and 3 days is almost impossible, but still, it is much less expensive than tearing down a wall or buying new furniture, right? Painting is a lot of work. I have thought about repainting my son’s room, but m husbands doesn’t want to paint over the stripes I made him do the first time we painted. Oh well. I love the names of the Behr paints. I think I might pick colors by their name… lucky potato. Love it! Glad to see that Jeffery made the blog. =) The house looks good! Love the colors you chose! 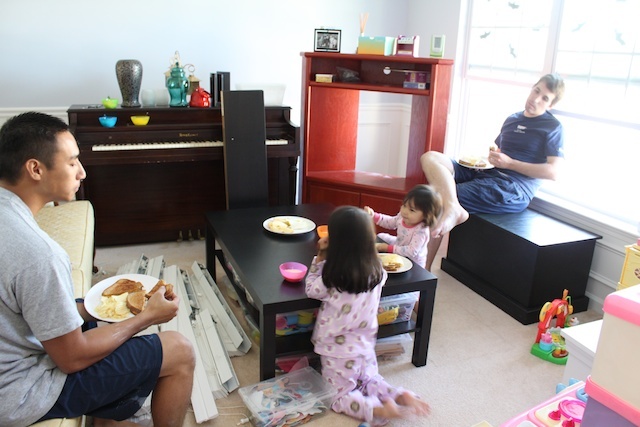 It’s funny… we just went from color to swiss coffee white in our living room and dining room… I love it! It brightened things up and made everything look so crisp! I never would have thought that I would like white in my house, Tom talked me into it. Love your colors!